Sound Qaulity:CVC technology for noise and wind suppression,full duplex sound quality.Support external U-disk TF card(Up to 32G),can play music files on MP3 WMA WAV APE FLAC format. 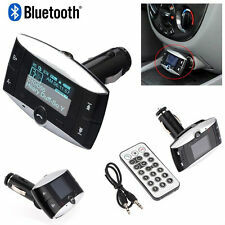 1 x Bluetooth Car FM transmitter Kit. 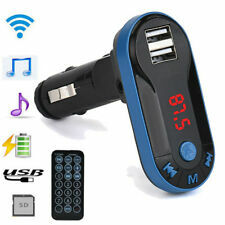 Wireless Blue tooth handsfree car kit FM transmitter. Works great. I have used others, but this is the best. Love the phone answering feature. My truck's radio is broken, the wiring is messed up. Unforunately this also leaves us without a hands free option when answering phone calls. I purchased this in hopes we'd be able to receive / male calls wirelessly and it worked ! Once I plugged it up and connected it to bluetooth the charger became my microphone and speaker. The sound is crisp and clear for such a small device. It is also able to play the radio from the device so we no longer need to use porable speakers or our iPhone speakers to har music. Handy, sylish, and compact ! Thank you. This is a great product. You can use it for music, maps and phone calls. Very simple to operate. Glad I made the purchase.